One of the largest of the Indian forts, the Mehrangarh Fort is situated in the city of Jodhpur in the Indian state of Rajasthan. 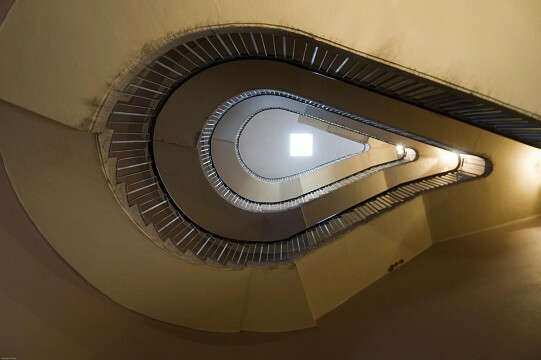 Built on an elevated ground which rises up to 400 feet, the fortress is enclosed on all sides by imposing walls which are 69 feet wide and rise to a height of 118 feet. Within the boundaries of the fort walls there are a number of palaces with spacious courtyards which are spectacular for their exquisite carvings. This 5th-century-old fortress is a popular filming location and parts of the famous Hollywood movie, ‘The Dark Knight Rises’, was shot in this fort. The word “Mehrangarh” is derived from two Sanskrit words – Mihir meaning “Sun” and Garh meaning “Fort”. So the name Meherangarh can be translated as — “Fortress of the Sun” or “Sun Fort”. Originally named Mihirgarh, the name has been changed to Meherangarh over time. 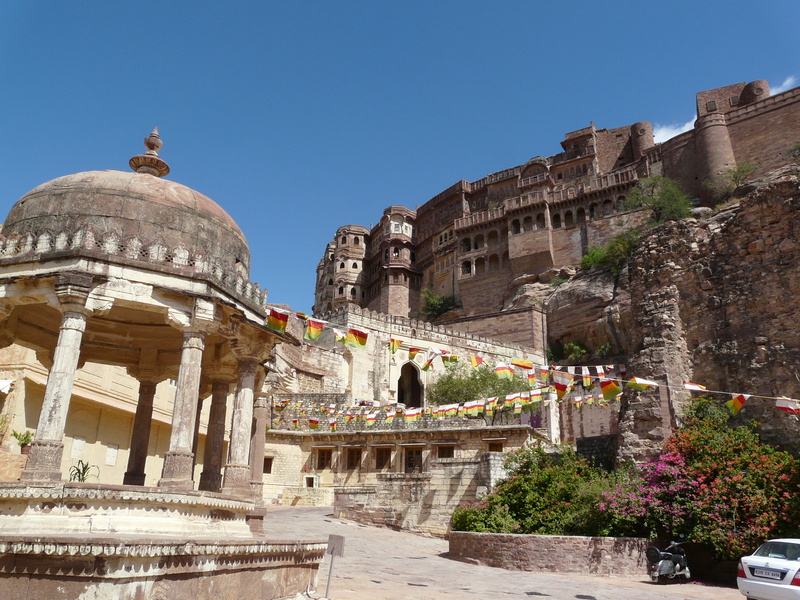 The Sun God was the patron deity of the Rathore family and so that is why they named the fort Mihirgarh. The 15th century ruler of the Rathore dynasty was King Rao Jodha, who was one of the 24 sons of King Ranmal. Since the city of Mandore, which was already more than a thousand years old, was no longer adequately secured, just a year after Rao Jodha’s coronation he decided to transfer the capital city to Jodhpur which was more conveniently located on his kingdom’s map. With the help of Rao Nara, King Rao Jodha successfully routed the Mewar army at Mandore, after which Rao Nara was granted the title of Diwan by the King. 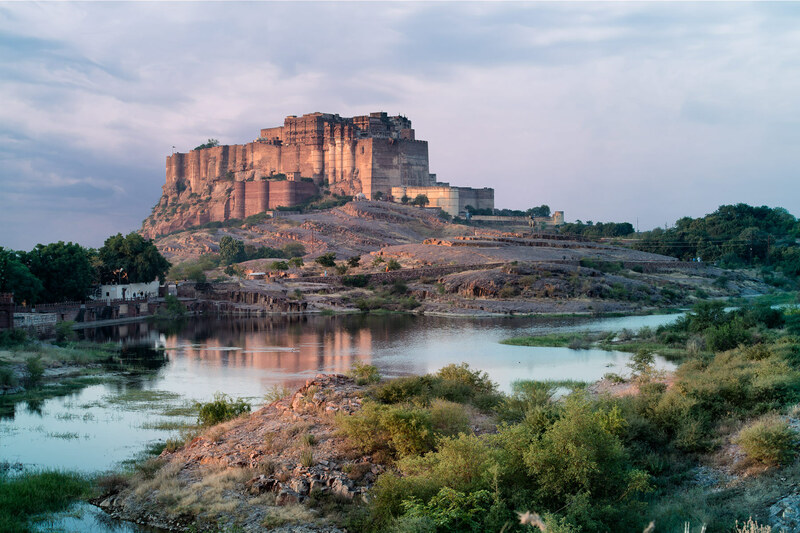 With the newly appointed Diwan’s help, Rao Jodha laid the foundations of this new fortress on a rocky hilltop at Jodhpur in the year 1459 AD. The hill on which this fortress was built was previously known as Bhaurcheeria or the ‘Hill of Birds’. According to local legends, while building this fort the Rajah decided to evict the sole inhabitant of this hill, a recluse called Cheeria Nathji or the ‘Lord of the Birds’. On being evicted by the royal troops the hermit was angry and he cursed the King that his citadel would forever suffer from a scarcity of water. The Maharaja immediately tried to appease Cheeria Nathji by constructing a house and a temple near the site where the hermit used to meditate regularly until his death. 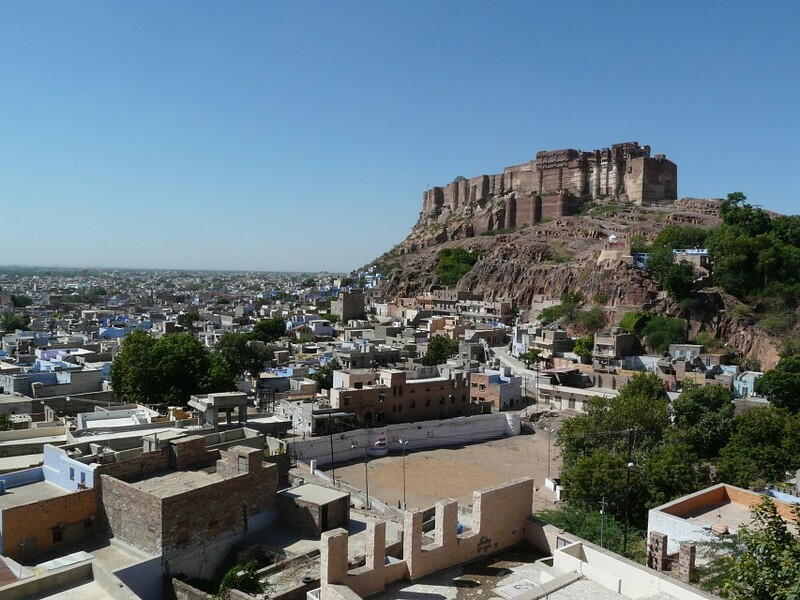 However in spite of this legend, even to this day Jodhpur is frequently plagued by an acute shortage of rain and droughts which occur here at an interval of every three to four years. In an attempt to win the blessings of the Gods so as to make his fort more propitious, the Maharaja buried alive a man named Raja Ram Meghwal under the foundations of this building. Meghwal was guaranteed that in his absence his family would be well taken care of by the King. Even now, descendants of Raja Ram Meghwal lives within the fort compound at Raj Bagh. 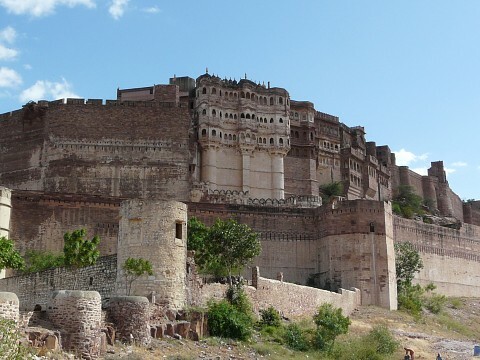 Located in the heart of the city of Jodhpur, the fortress sprawls over an area of 3.1 miles This fort is connected to the main city of Jodhpur by a winding road. On the left of the fortress one will find the Chhatri, or an elevated platform with a dome, dedicated to the warrior, Kirat Singh Soda, who died on that spot while defending this fort. 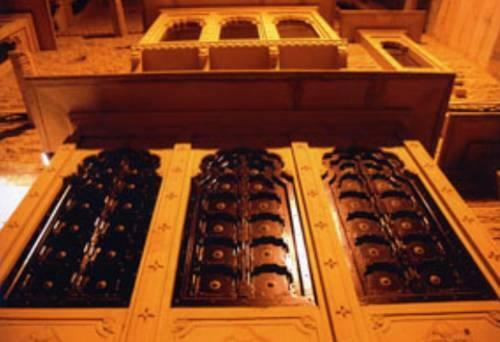 This fort has seven gates out of which the Jayapol Gate, or the ‘Gate of Victory’, is the most famous one since it was built by Maharaja Man Singh to celebrate his victory over the armies of Bikaner and Jaipur. The second gate of the fort, known as the Dedh Kamgra Pol, still bears the imprints of cannon ball attacks on its walls. The Fattehpol Gate which also means ‘Victory Gate’ was erected by Maharaja Ajit Singh to commemorate his victory over the Mughals. The Loha Pol or the ‘Iron Gate’ inside this fort still bear handprints or the “Sati Marks” left by the Queens who ended their lives in the funeral pyre of their husband, Maharaja Man Singh. 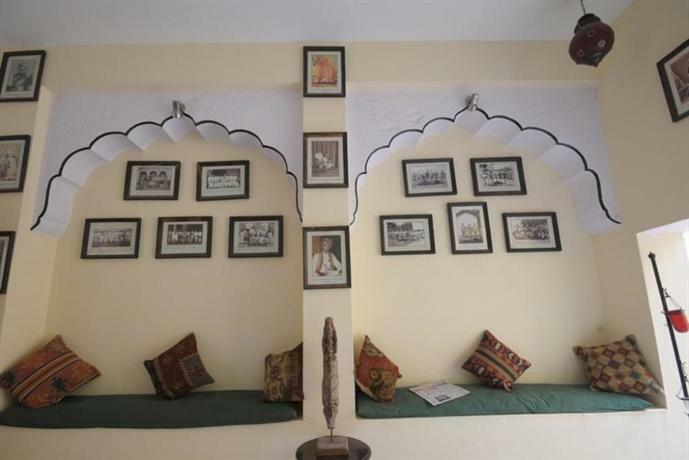 Of the palaces within this fort, the Moti Mahal – “The Palace of Pearls”, Phool Mahal - “The Palace of Flowers”, Sheesha Mahal - “The Palace of Mirrors”, Daulat Khana and the Sileh Khana are noteworthy for tourist visits. 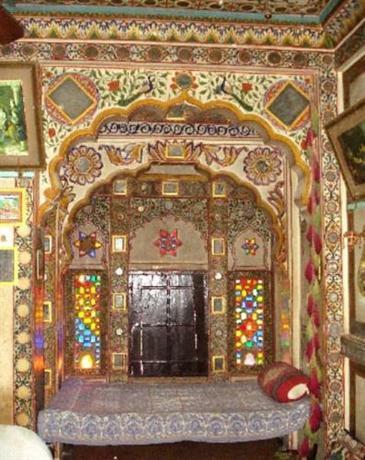 The museum inside the Meherangarh Fort is one of the best of its kinds in Rajasthan. Here one can see a collection of royal palanquins which includes the famous domed Mahadol Palanquin which was won from a battle in Gujarat in 1730. The elephant, Howdas, displayed in this museum were basically double-compartmented wooden seats, gilded with precious metals which were fitted on an elephant’s back. The first compartment with more leg space was meant for the Kings and the rear seat was meant for the bodyguards. 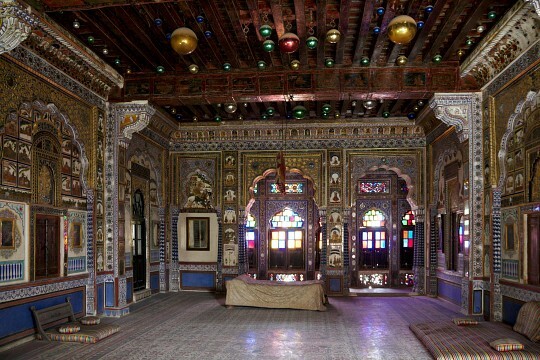 One can also see a stunning collection of Rajput and Mughal era paintings at the Daulat Khana. The armory inside this building exhibits a fine collection of weapons and armors which include exquisite sword-hilts made of silver, jade or rhinoceros horns, ruby studded shields of ivory, guns carved with gold and silver work and the personal swords of the Kings of Jodhpur. One can also see the swords of many emperors inside this gallery, including that of the great Mughal Emperor , Akbar. Turbans form an important part of the culture of Rajasthan and in the Turban Gallery in this museum, one can see a vast collection of head gears and turbans used by the erstwhile royalties. One can also see a curious display of various folk instruments in one of the galleries inside this building. This fort is open every day from 9.00 AM till 5.00 PM and the entry fee is ₨ 60 ($0.96) for Indian tourists and ₨ 400 ($6.40) for the foreigners. One can reach Jodhpur or the Blue City, by taking a train from Jaipur, the capital of the state. The distance from Jaipur is 204 miles and it takes about 6 hours to reach the site by train. One could also take a direct train to Jodhpur from Delhi which takes about 9 - 10 hours to reach this place. Jodhpur doesn't have an airport and so the nearest airport is the Jaipur International Airport which is located near the Pink City, Jaipur. As this landmark is located near the Thar Desert, its best to visit this location during the Indian winter seasons, that is from the month of October till the end of February. 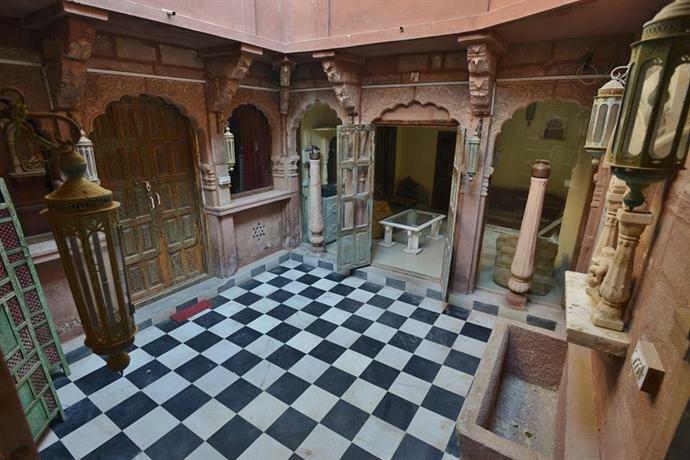 Travelers in Jodhpur should surely visit the ancient town of Mandore just 6 miles north of Jodhpur, which is scattered with many monuments and also has a ruined fort. 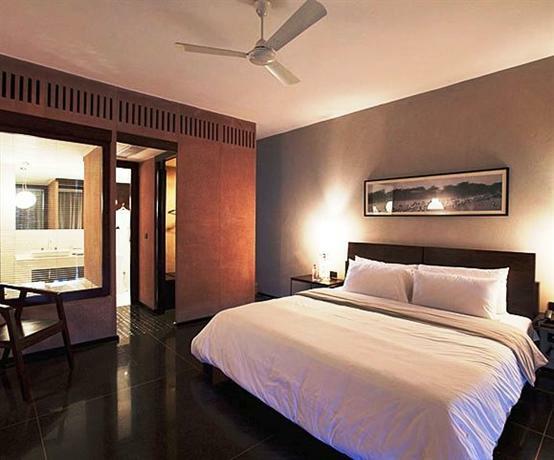 Visitors would also love to see the beautiful Amer Fort or the Amber Fort in Jaipur while visiting this glorious land.